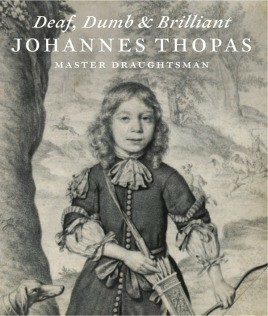 Until recently, the Dutch draughtsman Johan Thopas, who was born in 1626 both deaf and dumb, was only known to a small group of connoisseurs, dealers and collectors. However, his remarkable, subtle and technically refined portrait drawings on parchment deserve a wider audience. Unfortunately, due to sales rights restrictions, we cannot offer Deaf, Dumb & Brilliant for sale in your country. Until recently, the Dutch draughtsman Johan Thopas, who was born in 1626 both deaf and dumb, was only known to a small group of connoisseurs, dealers and collectors. However, his remarkable, subtle and technically refined portrait drawings on parchment deserve a wider audience. This handsome publication, the first devoted to his work, will prove to be an eye opener for many art lovers. Beginning with his earliest works (two beautiful miniatures of 1646 in the Fondation Custodia in Paris), Thopas produced incredibly refined drawings, usually with lead point on parchment. He had an almost magic control of the lead point, and his sense of texture and the way he was able to achieve this with minimal means is astounding, setting him apart from other draughtsmen in the Dutch Golden Age. Thopas was also able to capture brilliantly the characters of his sitters – such as the sulky husband and trouser-wearing wife in the 1684 companion pieces in the Victoria & Albert Museum, London. Apart from lead-point drawings, Thopas made several drawings in colour, on parchment and on Japanese paper. In most cases these drawings were done after life, although we do know that the large commission he received from the Bas-Kerckrinck family in Amsterdam included several drawings that were done after existing portraits. Furthermore, he produced at least one brilliant copy after a painting by Cornelis Cornelisz van Haarlem, Venus, Mars and Cupid, and even a painting, portraying a dead child. He must have made more paintings and certainly more drawings than the seventy we know today (all of which are catalogued and illustrated here). In this exhibition his only known painting and the one mythological drawing are accompanied by thirty of his most beautiful portraits, from private collections in the US, Canada, United Kingdom and the Netherlands, as well as well-known museums and print rooms, such as the Albertina in Vienna, the Amsterdam Rijksmuseum, the Städel in Frankfurt or the Victoria & Albert Museum in London. The author of the catalogue, Prof. Dr Rudolf E.O. Ekkart, is regarded as the most important connoisseur in the field of Dutch sixteenth- and seventeenth-century portraiture and the author of many important monographs and other publications in the field of Dutch portraiture. He was Director of the Netherlands Institute for Art History (RKD) in The Hague between 1990 and 2012 and gained momentum as Chairman of the Committee that carried his name and proved responsible for the return of many looted works of art that were returned to the heirs of many Jewish collectors in The Netherlands. Included in the book are Dutch and German translations of the essays.